In 1980s Los Angeles, young and ruthless investor Joe Hunt (Ansel Elgort) convinces his wealthy friends to come together and join his get-rich-quick Ponzi scheme. 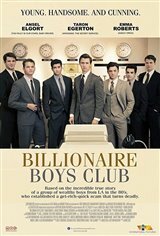 Because they feel they don’t have enough access to their families’ fortunes, his friends agree and the Billionaire Boys Club is formed. Freelance journalist and con artist Ron Levin (Kevin Spacey) is approached by Joe to partner with the group on the promise of a deal that’ll earn them a payout of a quarter of a billion dollars. He agrees but double-crosses them and cons them out of their money. Indebted to a lot of people and now under criminal investigation, the club plots to get their money back from Levin by murdering the con man.